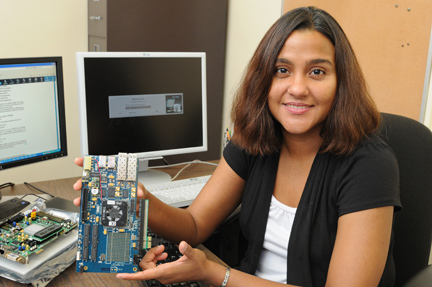 Marianne Hromalik, SUNY Oswego assistant professor of computer science, displays a computer circuit board that includes a detector (bottom right gray rectangle) of the type used to capture and store X-ray data used in scientific research. Hromalik is working as a partner in a Cornell University grant to develop the software that will make detectors that are versatile and less costly. A new SUNY Oswego computer science faculty member recently began work on programming more versatile detectors for X-rays used in a wide variety of scientific experiments. Cornell’s Laboratory for Atomic and Solid State Physics has subcontracted Marianne Hromalik to work on programming integrated circuits for devices used to examine the structure of viruses and proteins, to monitor materials fatigue in aircraft parts and to do much more. Hromalik completed her post-doctoral work at Cornell University this spring. She is now part of a three-member team for Oswego’s planned electrical and computer engineering program. The new assistant professor can see substantial benefits for Oswego from her partnership in the project. The project also can mean new equipment and conference travel for SUNY Oswego, as well as peer-reviewed publication for Hromalik and her associates. The personnel portion of Cornell’s three-year Department of Energy grant totals about $500,000, Hromalik said. SUNY Oswego will receive about 22 percent of that, or $34,974 a year for Hromalik’s one-day-a-week services to the larger project in Ithaca. To begin to visualize Hromalik’s work, it may be handy for non-scientists to think of X-ray machines used in airports and hospitals. But the kind used in detailed molecular studies are called synchrotron radiation instruments, capable of imaging staggering numbers of X-rays to study substances and objects at nanoscale resolutions, in time intervals measured in billionths of a second. A sophisticated device called a pixel array detector — a multilayered integrated circuit driven by software — captures and stores the data generated in experiments using synchrotron X-rays. The rays help scientists observe the behavior of substances or objects subjected to cold, light, pressure and other stressors. In contrast, the detectors are small, about the size of the palm of a hand. In the past, detectors have been designed for a specific experimental application. The development of detectors is years long and costly. That’s where her expertise comes in. Hromalik, a native of the Caribbean nation of Trinidad and Tobago with a doctorate from the University of Sussex in England, is working on a field-programmable gate array implementation capable of changing the logic of a single detector to handle new jobs with only the download of new software. “We can change its function by reprogramming different logic gates to make detection more flexible, without having to rebuild it every time we want a new application, which is what they do now,” Hromalik said. Meanwhile, Cornell researchers, Oswego computer science chair Douglas Lea and Hromalik are working with computer science major Benjamin Paretzky to calibrate for “noise” and other systematic errors caused by silicon defects in another detector developed in the larger grant.